Instead of the traditional salary cap format, you build your lineup around a list of prop bets. For each contest you choose 10 prop bets plus 2 ICE picks that protect you from any late scratches or postponed games. Each unique prop has an “Over” and “Under” point value assigned to it and you will be rewarded that point value if that prop is correct. Get a free $10 credit with their first deposit of $10 or more when they enter promo code DAILYROTO on sign up. Available in the app store (https://itunes.apple.com/us/app/thrivefantasy/id1240062484?mt=8) or at Thrive Fantasy. Welcome to April 9 MLB DFS action. You’ll find Daily Fantasy Baseball Premium Cliff Notes for April 9 MLB DFS along with LIVE Premium Chat. Make sure you’re using the customizable projections tool, you’re actively participating in the live chat, and you’re reviewing the cliff notes to supplement your research and roster construction process. Very best of luck in tonight’s action! Our MLB DFS Optimizer is live. Arturo put together an overview with MLB DFS Optimizer Cliffnotes that walk through the various features and frequently asked questions (FAQs) from customers during testing. We have also produced a basic optimizer tutorial video on YouTube (linked below) as well as a power user optimizer tutorial for the most advanced tournament players on how to get the most out of the optimizer. You can join the #MLB channel in slack if you have additional questions. Unlike yesterday’s slate, we get a handful of strong, upper tier pitching options tonight. We still get a clear tier one option, though, as Jacob deGrom (NYM) has been nearly unhittable through two starts. In fact, he has a negative FIP! 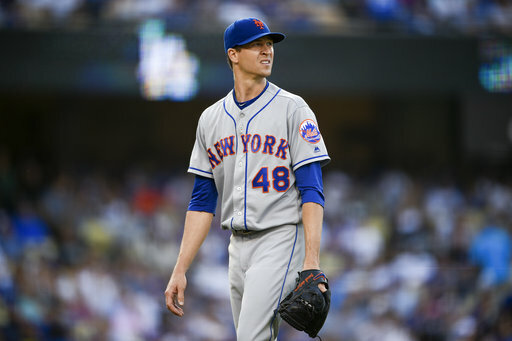 In 13 innings, deGrom has 24 strikeouts against just 2 walks, although he has survived some hard-hit aerial contact. He’s a massive -220 favorite against a Twins team that loses the DH (a big deal from a run prevention standpoint, as it’s Nelson Cruz). It’s cool in New York with the wind blowing slightly in, giving the Twins and IRT under 3. Even with Coors on the slate, we view deGrom as a foundational play. In a second tier, by himself, is Gerrit Cole (HOU). Basically all of the things we liked in regards to Verlander last night, we like for Cole tonight, just with a slightly lower outs baseline. He’s at a weird price tag on DraftKings, offering a discount to deGrom but in a spot where you might feel compelled to either pay up for deGrom or down to a strong next tier (Nola, Greinke) that leaves more room for bats. Cole and deGrom project for the same strikeouts, so you could talk yourself into Cole over deGrom for tournaments given that the reasons they are separated (win probability, run prevention) are a bit more volatile from start to start. The pricing is loose enough on FanDuel that you likely want to pay up for deGrom or Cole in cash games. On DraftKings, we prefer that route, but it’s possible to double up on values in order to heighten your offensive upside. In the tier below deGrom and Cole, we have Zack Greinke (ARI) and Aaron Nola (PHI). Greinke shoves aside velocity concerns to register 10 strikeouts. While he’s given up an absurd 6 HRs in two games, we feel there’s more good than bad here. Interestingly enough, he finds himself in a matchup against Texas that could result in more boom or bust results as the Rangers will swing and miss but have plenty of power. The Rangers lose the DH traveling to Arizona for this game. Nola, like Greinke, is at home and around a -135 favorite, albeit with a slightly lower IRTA. The two projected comparably from a per dollar perspective. Nola has a safer run prevention profile overall, coming off a season with a 2.37 ERA and 3.01 FIP. He has a GB rate over 50% for his career and a Hard-Soft% below 6%. He does face a good Washington team that possesses 6 bats with a wOBA baseline of .330 or greater. The primary cheap play on both sites, either as a complement to Greinke on DraftKings or a GPP pivot to allow for expensive bats on FanDuel, is Kyle Gibson (KC). The total in this NYM-MIN game is low (7.5), and this is a positive league and park shift for Gibson. Gibson has always been a good GB rate guy, but elevating his strikeout rate to around league average last season made him much more fantasy relevant. Other cheaper options include Derek Holland (SF) (big K rate boost last year jumping to the NL and strong start in that regard this season, heavily right-handed lineup but low run scoring environment) and Jake Junis (KC) (cheap for a high outs baseline if he can run good on BABIP and run prevention). If you’re feeling really risky or the need to get in a ton of expensive bats (DraftKings only), Matt Harvey (LAA), Mike Minor (TEX), and possibly even John Means (BAL) (super cheap but may only pitch 2-4 innings with Dan Straily following in relief) are your options. In our model, the top three teams rate relatively close in stack score, but the teams playing in Coors Field sit atop the ranks. Max Fried has pitched quite well in his young career: 2.94 ERA, 3.97 FIP, 3.61 xFIP, 24.6-percent K rate, 11.8-percent BB rate (high) and a 3.89 SIERA. However, pitching in the thin Denver air is a whole new challenge for the youngster and the lineup is both loaded with right-handed power and complemented with Blackmon’s ability to hit in the split as well. They are the clear top team and are likely to end as the top-owned stack of the night. The Braves will have their hands full with Marquez in Coors Field but at least he features a glaring weakness: his relative ineffectiveness versus LHHs. While he struck out righties at a whopping 35.0-percent rate last year, lefties only whiffed at a 21.9-percent rate, and they posted a .341 wOBA, 1.42 HR/9 rate and 36.6-percent hard hit rate against him (en route to a 4.30 FIP). Guys like Freddie Freeman and Ender Inciarte hit near the top and would be the building blocks of this stack if fantasy owners choose to go that route. As for the Athletics, they are facing a long reliever by trade to start the game followed by one of the most power-prone pitchers in the league (Dan Straily). Whereas Marlins Park used to keep baseballs in the ballpark for Straily, that will not be the case in Camden Yards. Means has been stretched out, so it remains to be seen how deep he pitches, and it is possible the team needs to dive deeper into their bullpen than intended if either Means/Straily struggles early. The Athletics are heavily right-handed so they will earn the platoon edge against Means and Straily has allowed over 1.50 homers per nine innings to righties over the course of his career as well. Last season, Matt Harvey yielded a 1.94 HR/9 rate to LHHs and that was before he had to face a designated hitter instead of a pitcher. The Brewers will head to Angel Stadium tonight allowing them to do just that and slide Jesus Aguilar/Eric Thames into the lineup instead of Freddy Peralta. Harvey has struggled to retire lefties for a while now and our projected lineup has five for the Brewers including such names as Christian Yelich, Mike Moustakas and Travis Shaw. Good luck to Harvey and the only real positive he has going for him is the relatively pitcher-friendly ballpark. The third tier is condensed with offenses who should go overlooked especially beyond the Astros and Mariners. Houston features a ton of talented names and the Mariners have now scored at least nine runs in four consecutive games. There is both power and speed upside available for the Royals especially if Omar Narvaez draws the start being the plate. Arizona righties draw the platoon advantage versus a fly-ball prone lefty in Chase Field and the team ranks fourth in wOBA versus the handedness so far with a .256 ISO. The Dodgers face Dakota Hudson who has looked beatable by lefties in a tiny MLB sample (.422 wOBA allowed). That leaves us with the contrarian Phillies who face one of the better pitchers on the slate (Strasburg) but come equipped with a loaded lineup. Not a single catcher pops as a positive value on this slate but the two best values are unsurprisingly the catchers being projected to start in Coors Field: Chris Iannetta (COL) and Tyler Flowers (ATL). Unlike Flowers, Iannetta will earn the platoon edge against Max Fried, who has pitched quite well to this point (2.47 FIP and 2.92 xFIP in 7.2 IP). Still, most projection systems have the 25-year old as close to a 4.00 FIP pitcher and Coors Field does pitchers no favors. Iannetta’s .349 wOBA and .180 ISO baselines are enough to propel him to the top projection in a game where the Rockies are being implied to scored 5.6-runs. The Braves are not far behind but Flowers’ baselines (.308 wOBA, .145 ISO) are also nowhere as impressive. If looking for salary relief, Buster Posey (SF) and Omar Narvaez (SEA) are both $300-plus cheaper than either Coors Field catcher. Posey hits in the middle of his team’s lineup and Lucchesi’s 44.3-percent hard hit rate allowed to RHHs a season ago was second worst amongst starting pitchers on this slate (behind only Holland). On the other hand, Narvaez hits in the lower-third of the red-hot Mariners lineup that has now scored at least nine runs in four consecutive games. Junis’ 4.62 FIP against LHHs left much to be desired last year and Narvez is $200 cheaper than Posey. Optimals do not prioritize the position at all which is why many are choosing to punt with a $2,900 Martin Maldonado (KC). He owns the platoon advantage on Gonzales and Royals own a respectable 4.5-run implied total. He helps fit aces alongside upside bats on a slate without much value. Freddie Freeman (ATL) projects for almost 1.5 more fantasy points than any other first baseman as he draws a R-L matchup in the hitters’ haven that is Coors Field. For as good as Marquez was last season, he still had his struggles with LHHs: .341 wOBA, 1.42 HR/9 rate, 36.6-percent hard hit rate and a 4.30 FIP. Even at $5,100, Freeman pops as the best value at the position, but our DraftKings models are prioritizing starting pitching and other Coors bats to forcing him into cash game rosters. Justin Bour (LAA) is amidst a brutal start to the year but the DraftKings pricing algorithm is more than accounting for that start. Finally last night, Bour hit his first homer of the season, but he still is flirting with a .100 average. Our baselines do not care about recent streaks and Bour owns a .342 wOBA baseline and a .218 ISO baseline against RHP. Bour hit 20-plus homers in back-to-back seasons playing half his games in Marlins Park so Angel Stadium should be no big deal for him either. Probable starter Freddy Peralta is coming off a great start but he was blasted by lefties last year to the tune of a .374 wOBA, 1.59 HR/9 rate, 46.0-percent hard hit rate (worst of any pitcher on slate) and 5.16 FIP. We view him as a fine pivot from Freeman in cash games. On FanDuel, Chris Davis (BAL) is difficult to overlook at only $500, even though he has set the record for most consecutive at-bats (ABs) without a hit. Anderson pitches to contact and one of Davis’ main flaws is his tendency to swing-and-miss. Davis hit the ball hard a few times on Monday so there is potentially a light at the end of the tunnel. Rostering Davis is the easiest path to use an ace and stack them with an offense that you would otherwise be unable to do so. If Davis does not make the lineup, guys like Mark Reynolds (COL), Christian Walker (ARI) and Tyler Austin (SF) are priced quite affordably and slide in nicely alongside deGrom in cash lineups. Reynolds is playing in the top hitting environment but Austin and Walker both own the platoon advantage and own ISO baselines over .200 as well. Whit Merrifield (KC) pops as the only positive value at second base on DraftKings due to his combination of speed upside and skills in the split (.346 wOBA, .156 ISO baselines). In 182 ABs versus LHP in 2018, Merrifield posted a .402 wOBA, .368 xwOBA, .181 ISO and 39.5-percent hard hit rate plus he stole a team-high 18 bases in the split. Omar Narvaez is one of the poorest throwing catchers in the league so the potential for a stolen base only increases comparatively to normal. Again, he is a tough player to fit alongside some of the aces, so our optimizer is again choosing to focus on more affordable options at this position. Ian Kinsler (SD) is expected to lead off against Holland for the second time in a week and Kinsler is a full $700 cheaper than Merrifield. AT&T Park is the one of the worst hitting environments in the league but Kinsler still owns a .315 wOBA baseline and .153 ISO baseline against a pitcher who sports a career .346 wOBA allowed to RHHs. Even in a treacherous park, the team is being implied to score around 4.0 runs, and Kinsler will at least tie for the team lead in plate appearances. His affordability is his main selling point at position where most are expensive. In tournaments, Rougned Odor (TEX) and Jonathan Villar (BAL) are around appropriately-priced and feature similar power/speed upside to Merrifield. Neither team is being implied to score as many points as the Royals but both Greinke and Anderson have seen their K rates depreciated as they have aged. On FanDuel, Wilmer Flores (ARI) is being projected to hit third with the platoon advantage against fly-baller Mike Minor, and he owns excellent baselines despite only costing fantasy owners $2,200. He is tough to overlook. Garrett Hampson (COL) and Brian Dozier (WAS) are also priced in a similar tier and are intriguing pivots. Nolan Arenado (COL) reigns supreme at third base against lefty in the friendly confines of home. Last year, Arenado produced an incredible .488 wOBA, 197 wRC+ and .368/.451/.747 slash line against LHP, and he was even better at home specifically (.555 wOBA, 241 wRC+). Fried is still relatively unproven and the Rockies’ run total is highest on the slate. Fading Arenado in cash games is a risky proposition but there is merit in tournaments where he should be one of the highest-owned players on the slate. Matt Chapman (OAK) and Josh Donaldson (ATL) constitute the next tier and our model prefers Chapman’s upside to Donaldson’s even with the Coors advantage going to the Braves’ third baseman. That is presumably because long reliever John Means will draw the start for the Orioles and will likely be relieved by pure fly-baller Dan Straily (who allowed two homers in 1.1 IP in his season debut). Chapman and Donaldson both feature ISO projections over .210 in their respective splits but Donaldson faces a tough individual matchup (Marquez) even with the positive park shift. In 90th percentile models, both Travis Shaw (MIL) and Alex Bregman (HOU) rate as top five per-dollar options. Shaw’s upside is especially intriguing against Matt Harvey and his 5.13 FIP against LHHs a season ago. Trevor Story (COL) is another one of the powerful Rockies lefties to build around if at all possible in cash games. Our ISO baseline on him is a monstrous .290 and complements his .393 wOBA (which are both significantly lower than the numbers he actually posted in the split versus LHP a season ago). Story comes equipped with speed upside as well against a Braves team that will likely use Flowers behind the plate (a career negative seven rSB). The reason our models are skipping over the top values at other positions is because they are locking Story. Adalberto Mondesi (KC) is the logical alternative, and another player with both home run and steal upside, In a small sample size, Mondesi has proven to be a slightly superior hitter in the split against LHP, and to reiterate, Narvaez is also a poor throwing catcher. Corey Seager (LAD) and Jean Segura (PHI) are the tournament options who offer some degree of salary relief. Probable starter Daniel Hudson has yielded a .422 wOBA to LHHs in his limited sample at the Major League level. Seager’s .195 ISO baseline is a long way off from Story’s but he will also come at a significantly discounted ownership level. Segura is priced below $4,000 but the matchup against Strasburg is no walk in the park. He is best utilized as a member of a contrarian Phillies stack or mini-stack. Ramon Laureano (OAK), Khris Davis (OAK) and Mark Canha (OAK) pop as our top values in the outfield on FanDuel as our model loves the value of their stack yet again. Means is slated to start the ballgame, and all these players own the platoon advantage against him, and then Dan Straily and his 32.1-percent ground ball rate from a year ago will relieve him. If one of both struggles, that leaves a chance for the Athletics to get even deeper into a bad Orioles bullpen, and Vegas is implying a hefty 5.3-runs for this team. Laureano is the top value of the bunch but Davis naturally jumps ahead in 90th percentile optimals due to his massive power. All Athletics outfielders, including Stephen Piscotty (OAK), are rosterable in all formats on this slate. Ian Desmond (COL) and Charlie Blackmon (COL) both are projected to hit in the top four of a favored Rockies lineup at home. On FanDuel specifically, Desmond is strangely underpriced, costing fantasy owners just $3,000 with the platoon advantage. Blackmon often goes overlooked in matchups against LHP even though he posted a .354 wOBA and 107 wRC+ against the handedness a year ago (and was even better in 2017). Ronald Acuna (ATL) and Ender Inciarte (ATL) draw a relatively tough matchup for Coors Field as Marquez is clearly the top starting pitcher on the Rockies. For Inciarte’s sake, he earns the platoon advantage against a pitcher who still struggled to contain lefties last year, and Acuna is popping for his skills combined with the game environment. Inciarte is the preferable cash play but we love the thought of Acuna getting overlooked because the public believes in Marquez. Kole Calhoun (LAA) is priced at just $3,400 on DraftKings against Peralta and his .374 wOBA against LHP in 2018. To reiterate, his 5.16 FIP in the split last year ranked second worst amongst pitchers on this slate, behind only Fried (in a 8.2 inning sample).